You can't study American militia history and not end up with views regarding gun control. My concern is, and hopefully will always be, the issue of its effect on national defense. As noted in my short essay on the battle of Bladensberg, gun control can have serious effects on our ability to defend not just private property, but Public property and the nation as a whole. Gun-controlists like to say all you have to do is write in their law that it doesn't effect the military or the Police and "Boom" its all protected. But reality is that just saying it won't doesn't mean it won't. This page will be devoted to the gun control argument and how advocates tend to always wrap their proposal as Win-Win. Its always common sense, and always works in some other location. This page will be devoted to what they don't talk about. In 2015 following the shooting of a Virginia News reporter and her cameraman several people began stating that America needs to learn the lesson of Australia and how they solved their gun violence problem following the 1996 Port Arthur shooting. I intended to write a blog post on these recent statements, but when the post went beyond two pages it became necessary to use it as a start for this page of my website. Take note, the advocates will say I said it wrong for they always say Gun homicide and suicide. But they also know people have been taught that murder and suicide require a gun, according to gun-controlists. Which brings the point: what did Australia get from banning over 700,000 guns (1/5th of the nation's firearms). According to Australian Gun controlists they haven't had a mass killing (by a gun) and murder and suicides were cut by 59% and 65% respectively. Sounds fantastic, if it was true. Again, the impression is the total number of murders and suicides were reduced by that amount because the advocates say there was no corresponding increase in non-firearm deaths. That would make Australia the exception, not the rule however. Following its 1996 Dunblane massacre, England implemented a stringent Handgun ban. For a few years after the ban was implemented Firearm homicides spiked only to drop back to the level before the ban was implemented. In 2010, in Cumbria England, a man with just a double barreled shotgun killed 12 people before being stopped by British Police. This made it impossible to cite the law as preventing all mass gun murders. As for suicide rates, Englands rate hasn't changed that much in over a quarter century and is comparable to other English nations including the United States. As a result, gun-controlists do not cite England's newest laws as having any useful effect on reducing murder or suicide. In Canada, strict gun control in the form of the long gun registry was implemented following the killing of several female students at the Ecole Polytechnique in 1989. The Long gun registry was long cited by Canadian gun-control activists with again banning mass killings, and reducing gun violence, murder and suicide. But within a few years of implementation the program that was only to cost 2 million pounds a year, was costing $629 million by 2002. By 2004 the estimated total cost of the registry had risen to $2 billion. And for that cost the nation had seen textbook transition of firearm homicides to other means. ​As for suicides, gun-controlist bragged that firearm suicides dropped by 55% (from 1,287 to 568). Canadian suicide researchers then cite that non-firearm suicides rose by 52% (from 2,046 to 3,116). Please note- higher reduction constitutes 720 fewer deaths, smaller increase means 1,070 more deaths). In the end, in 2012 the Long Gun registry was repealed. And with the combined Charley Hebedo massacre and the November 2015 Massacre in Paris, attention is now focused on the long denied Black market in firearms that exists in otherwise heavily gun controlled Europe. Some estimates are to 16 million illegal guns in France alone (including fully automatic weapons). In addition, with the rise of Russia, Eastern European nations are beginning to recreate national militias incase of an attack. As a result, gun pocession by non-military citizens (pocession not to be mistaken for ownership) will be increasing in most of europe, regardless of European gun control heritage. So what of Australia, is it truly the exception where everything was beneficial and there was no negatives. Only if you ignore the Monash University shooting in 2002: granted only two students were killed and five wounded, but that was because other students and teachers tackled him. Australian law prevented him from having high capacity magazines, so he had five pistols in holsters around his waist. Higher death numbers come from the 2011 Hectorville Siege where three people were killed and two wounded (one an officer shot in the face), the assailant then holding police at bay for 8 hours. In September of 2014 the Hunt family murders where the husband killed his wife and children before killing himself. And for the moment, in December of 2014, a lone gunman claiming connection to ISIS took 17 people hostage in a Sydney Cafe. In the end the hostage taker killed one hostage. The subsequent Police assault killed the hostage taker, one hostage, wounded three hostages and one officer. And these are the ones with firearms. Other Australian mass murders since 1996 were the Childers Hostel fire that killed 15 people, The Churchill fire- 10 killed, the Quaker Hill Nursing Home fire- 10 confirmed deaths, but possibly as many as 21, and the Cairns stabbings where a mother stabbed to death 8 children. The worst mass killing in Australian history, the black Saturday Brushfires, cannot be attributed to one person, but killed 173 people and injured 414 In February 2009. As for reductions in homicides, like Canada, Firearms were a lesser method for death then non-firearm sources for years before the ban. Twenty years before the ban and buy backs only 30% of homicides were by firearms (around 90 deaths per year). By 2014 the number of deaths had dropped to 35, representing the 2/3 reduction the gun-controlists bragg about. But total homicides was 286 in 1976 to 262 in 2014. 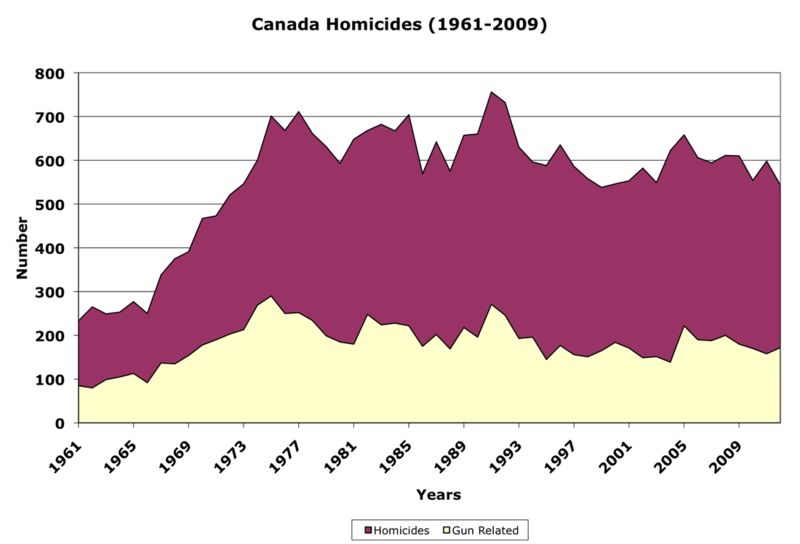 Gun related homicides were cut by 66% according to the numbers but the reduction essentially flat lined starting in 2006. Total homicides have gradually dropped over this time frame, but that indicates the change in gun related isn't the source of the reduction in overall since we would have seen the change by 1999. Regarding suicides, in 1979 there were 1,677 suicides in which 523 were gun related. In 2010 there were a reported 2,522 suicides of which 165 were gun related. If you look only at the gun related suicides you have a reduction of 358 or a reduction of nearly 70%. But for the non-firearm suicide you end up with an increase from 1,154 to nearly 2,400 before it temporarily drops to 1929 before rising again to 2,357 by 2013. In the end there has been no permanent reduction in total suicide numbers in Australia. Further with a 2013 suicide rate of 10.9 it is barely below the United States value of 12.6. Thus the many claims of a massive improvement in suicide numbers in Australia are invalid. The gun related was dropping before the the gun roundup, the rate of drop did not increase, and as gun related reduced, nongun suicide has fluctuated to where it is back where it was when the roundup occurred twenty years ago. Now some with larceny in their hearts might want to suggest the rise from 2005 to 2013 is caused by a rise in population. So what is the death rate (Murder, suicide) based on 100,000 people. Again the gun related death rate dropped from just over 4 per 100,000 to just under 1 per 100,000. But its noted that the rate was dropping for nearly 20 years before the ban. Furthermore the rate has been flat lined since 2006. Non-gun, after peaking at just over 14 per 100K, dropped to about 11 in 2003 and has flat lined ever since. US Death rate by firearm is approximately 10 per 100K with 7.5 nongun.